Local area charity benefits from annual beer fest! As a result of the very successful 2016 Okanagan Fest of Ale Craft Beer and Cider Festival, the Okanagan Fest of Ale Society was able to donate $40,000 in net proceeds to charity in the community. 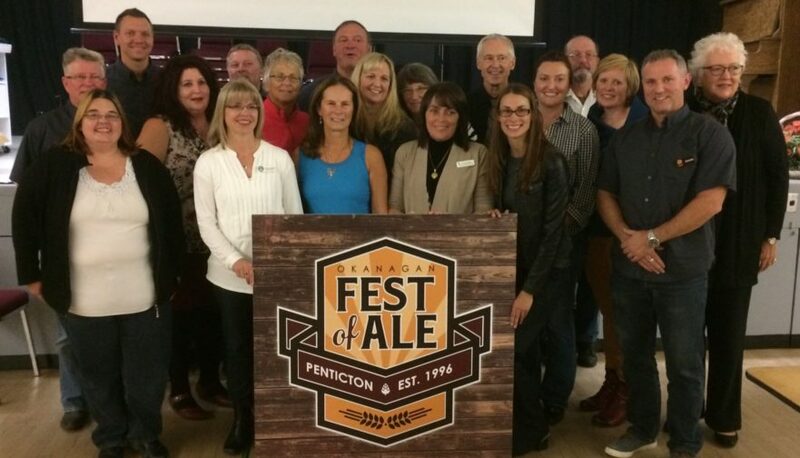 At a presentation held in Penticton Thursday October 13th, 2016 the Okanagan Fest of Ale Society’s Board of Directors, event volunteers, sponsors, and supporters gathered to celebrate the success of the 21st Annual Okanagan Fest of Ale. A great night was had by all at the Volunteer Appreciation & Charity Disbursement Dinner. $40,000.00 in grants were distributed to 13 well-deserving, local charitable organizations. Highlighting the event, were presentations made by representatives from each of the organizations detailing their organizations initiatives. “As a volunteer it is great to see where the fruits of our efforts are directed, and see firsthand, how we are helping the community,” offered one of the volunteers in attendance. The annual event, managed by a volunteer Board of Directors and staffed primarily by community minded volunteers is thrilled to have “gifted back” $577,660 to charity since its inception in 1996. The Okanagan Fest of Ale Board wishes to extend its thanks to all the volunteers, sponsors and patrons for their continued support of BC’s premiere craft beer festival over the last 21 years. Be sure to save the date for 22nd annual event taking place April 7th and 8th 2017 in Penticton.